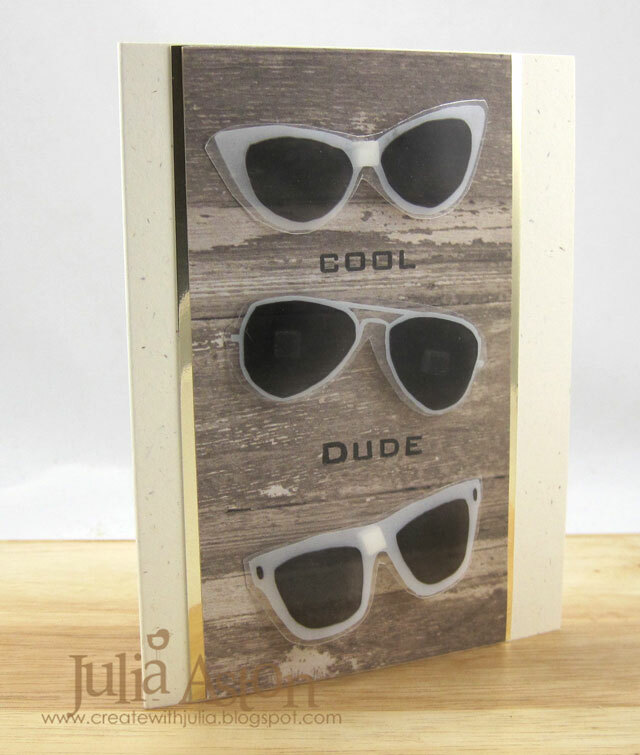 I have been waiting all summer for a challenge to come up where I could use these 'cool dude' sunglasses. I cut them out of the cups my Starbucks Venti Matcha Iced Green Tea Lattes have been served in this summer! There were four frame styles on each cup - and I immediately thought "I can use these on a card someday!!!" and today's the day!! Here's my card. 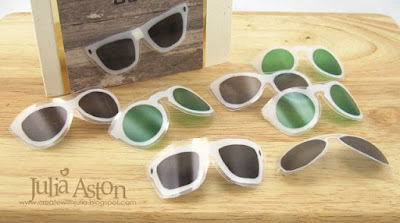 I adhered the sunglasses to the barn board patterned paper with foam dots. The stamps are from Free Spirit Sentiments by Waltzingmouse. I layered the patterned paper to a slightly larger piece of mirrored gold card stock. You can see - I went pretty literal with my card design! It was so nice of Starbucks to have the glasses on their cups in the perfect size for our cards, don't you think??!! Accessories: sunglasses from Starbucks cold drink cup, foam dots. Very cool set of glasses! Great way of making them. JULIA!!!!! Aren't you clever?! LOVE this! I've been staring at those all summer, and never had this thought ... doinggg ... these are awesome. WOW! You thought,right! You sure did use them, too! Totally rocked the inspiration piece! Fabulously done! Fantastic card, Julia! What a super idea Julia and your right it is a very cool dude card. How to know if you're a crafter: you see everything as a potential card. Haha! But they did turn out so cool!! 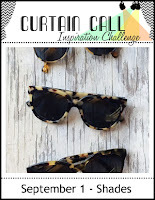 Love these shades and they're perfect for this challenge! Fun, fun fun! This is definately a 'cool' card Julia! So fun Julia! All the shades look fab! You did so good on this! The glasses are so much fun! What a fun card Julia. Love the recycled pieces... what a neat way of using them... and yes... it's the perfect challenge for them. 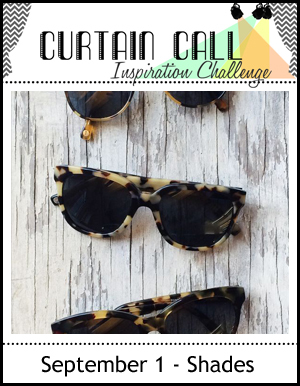 :) Thank you for playing along with us at the Curtain Call Inspiration Challenge. Oh my gosh what a fun idea and perfect time to use them! Nice way to repurpose them! Love the card Julia! Very cool....what a fabulous idea! wow!! those shades are super cool!!! loooove how you used them on this card. thanks for playing along with curtain call.